﻿How a beloved, decaying theme park became a world-class nature center. ﻿﻿﻿﻿Beloved by vacationing families for seven decades for entertaining Aquamaids and lovable swimming pigs, Aquarena Springs in San Marcos is no longer a glitzy theme park. Visitors to this ancient Texas treasure will now find Spring Lake much as nature intended. Since our early ancestors lived near the Spring Lake site nearly 20,000 years ago, Texans have had a love affair with the spring-fed lake. Resort history spans a period from the opening of the Spring Lake Park Hotel in 1929 to the final “swine dive” in the early 1990s. Now, the newly transformed and named Meadows Center for Water and the Environment offers a different one-of-a-kind experience, from globally significant water research initiatives to localized solutions to Texas’ water problems to ecotourism. The transformation wasn’t easy, and it’s been nearly 20 years in the making. 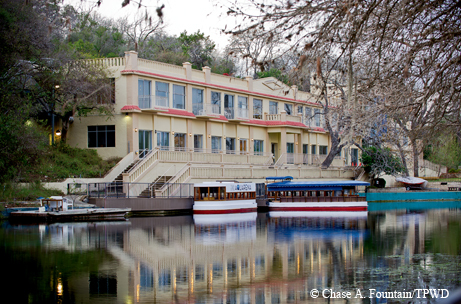 ﻿Glass-bottom boats are docked outside Spring Lake Hall, home of the Meadows Center for Water and the Environment, in San Marcos. The building was originally the Spring Lake Park Hotel. It all started in 1926, when A.B. Rogers purchased 125 acres surrounding Spring Lake with the dream of creating a “first-rate Texas tourist destination,” according to great-granddaughter Doni Weber. The Spring Lake Park Hotel was the first phase in realizing that dream. The hotel was considered a luxury resort, the epitome of 1930s art deco glamour, often hosting local swimsuit beauty contests and fancy parties on the rooftop. In 1946, the first glass-bottom boat was launched in Texas at Spring Lake, and visitors were given an exclusive opportunity to peek into the aquatic wonderland hidden just beneath the surface. The glass-bottom boats were, and continue to be, an exceptional opportunity to see a lush, verdant underwater ecosystem from the dry comfort of a boat. In 1951, the submersible Submarine Theater show made its debut, featuring swimming Aquamaids and Glurpo the clown, and was a smashing success. The aquatic performances won the hearts of visitors and became a mainstay of the theme park for decades. Ralph the diving pig (all 300 of them), introduced in 1969, became famous for his aquatic antics. There were other attractions as well, such as the Swiss-designed gondola sky ride that gave guests an unprecedented view of the springs from above, and the Texana Village, which offered a fun and educational trip back in time to the pioneer days. When I was a child in the nearby town of Wimberley, Aquarena Springs was a frequent indulgence. I loved and envied the graceful Aquamaids, and I delighted in watching Ralph make his famous swine dive. The park also housed one of the best restaurants in San Marcos and was the place to go for Sunday brunch. By the time the park was purchased by Texas State University in 1994, the magic of Aquarena Springs had faded into a beautiful memory. Over time, the glitz and glamour had vanished; what was once a resort and theme park experience unlike any other in Texas felt rundown and quaint in comparison to Six Flags Fiesta Texas and Sea World in San Antonio. Apparently, a swimming pig just can’t compete with a killer whale that does tricks. According to Ron Coley, who has managed Spring Lake maintenance and educational operations since Texas State acquired the site and is also an award-winning cinematographer, the university didn’t want to try to compete with the nearby modern theme parks and decided to do what universities do best — research and education. Sadly, there was only a small crowd of onlookers for the last swine dive. Many Texans didn’t have a chance to say goodbye. ﻿﻿In Aquarena’s heyday, Aquamaids and Polynesian-themed shows drew crowds. While many Texans still associate Aquarena Springs with Ralph, Spring Lake now offers a much more significant and profoundly meaningful experience. Offering one of the healthiest, most ecologically diverse habitats in the southwestern United States, Spring Lake and the upper 4.5 miles of the San Marcos River are considered critical habitat for eight federally listed endangered and threatened species, with some of those species endemic only to Spring Lake, according to Andrew Sansom, executive director of the Meadows Center for Water and the Environment at Texas State. “What a rare and wondrous opportunity for introducing and reconnecting your kids with the natural world,” Sansom says of the new experience at the former theme park. The last time I took a glass-bottom boat ride at Spring Lake, I was 8 years old. Recently I had the opportunity to take another voyage. I wasn’t sure what to expect, and I was a little worried that it wouldn’t live up to my fond memories. I was pleasantly surprised when I boarded the beautifully restored vessel. The unforgettable allure of the underwater wonderland called to me, and I quickly took my seat, once again mesmerized by the eternal springs below. With more than 200 springs pouring forth from the honeycombed limestone of the Edwards Aquifer at an unbelievable rate of 130 million gallons per day, Spring Lake contains water that is about three times cleaner than the EPA standard. That clean water provides the incredibly healthy habitat for the local, environmentally sensitive occupants. Several of these species, including the Texas blind salamander and the threatened San Marcos salamander, can’t be found anywhere else in the world. What some people don’t realize is that these endangered species act as an environmental indicator for the Edwards Aquifer. A fluctuation in these indicator species can warn water managers of any problems that might be associated with the quality of drinking water for more than 2 million Central Texans. Spring Lake provides this valuable ecological early warning system without expensive water resource infrastructure. An incredible complexity makes these pristine natural resources amazingly effective in providing filtration and ecological balance. While there have been decades of conflict over how best to protect the Edwards Aquifer, and its unique inhabitants, the Edwards Aquifer Recovery Implementation Program (EARIP) has finally addressed many of the concerns facing this vital aquifer. This past February, the U.S. Fish and Wildlife Service approved a Habitat Conservation Plan and “incidental take” permit, putting a formal stamp of approval on five years of work by the EARIP to balance water pumping and spring flow. Maintaining spring flow in the Edwards Aquifer protects not only the endangered species that live there, but also fresh water for Texans who rely on it. The natural biodiversity of Spring Lake, headwaters to the San Marcos River, makes it home to many animals, from great blue herons and red-tailed hawks to turtles, bass, channel catfish and bluegills. It has something for every nature lover. Spring Lake is thought to be one of the longest continually inhabited sites in North America. Archaeologists have excavated rare artifacts, some of which date back 12,000 to 13,000 years. The damming of Spring Lake in the mid-1800s allowed for the preservation of artifacts from all of the different cultures that have relied upon and enjoyed the cool, clean respite of the San Marcos River. From multiple tribes of American Indians to early Spanish settlers, and later the great tribe known as Texans, the headwaters of the San Marcos have been home to a wide diversity of human inhabitants, making Spring Lake ecologically, economically and culturally significant. In fact, Spring Lake could become a candidate for designation as a World Heritage Site by the United Nations Educational, Scientific and Cultural Organization (UNESCO), but that is years away. 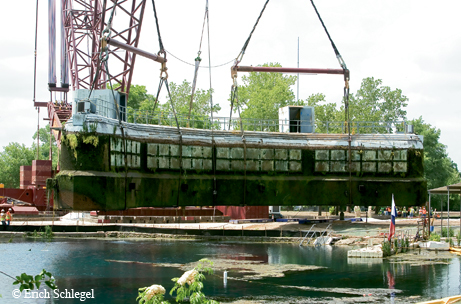 ﻿﻿﻿The Submarine Theater was pulled from the water last year as part of the Spring Lake restoration. These days, we sometimes hear about the land around a locally cherished swimming hole being bought up and developed into new homes. Less and less do we, as a community, rise to the occasion to save and preserve these special places that we grow up loving. Less and less do our children and grandchildren have access to these irreplaceable wild spaces. The Meadows Center for Water and the Environment, in collaboration with partners across the state, is addressing this problem. I’m a native Central Texan, but the first time I heard about the Meadows Center for Water and the Environment (then known as the River Systems Institute) was in Boston. While working on my master’s degree, I stumbled across some of the top-notch research publications the center had produced. It wasn’t until later, when I came back to contribute to its growing body of research, that I realized the Meadows Center was also restoring my beloved Spring Lake to its natural condition. While a part of me was sad to see the old Aquarena Springs go, the springs provide the perfect context for timely and significant research regarding the serious water issues that Texas continues to face. After the theme park closed in 1996, the university took some time to decide the best course of action. Recognizing the need for structure and strategic vision, the university recruited Sansom, former executive director of the Texas Parks and Wildlife Department, to help create a world-class research institute and nature center. The park had problems. Some people feared that the dam holding in Spring Lake would break. Not only was the old theme park infrastructure built on a known flood plain, it used outdated and hazardous materials, such as asbestos and lead paint. Floodwaters sank the old Submarine Theater and damaged other park infrastructure in 1998. By 1999, Texas State University had entered into a contract with the Army Corps of Engineers to restore Spring Lake to its original, natural condition. The park operated for several years in a limited fashion, offering glass-bottom boat rides and walks on the Wetlands Boardwalk. Last year, workers took some of the final steps toward transformation as they demolished the old visitors center, took down the remaining parts of the sky ride and pulled the Submarine Theater from the water. Invasive trees were removed, and native grasses have been planted. ﻿﻿﻿﻿Glass-bottom boat rides and scuba diving programs remain as features of the center. At 72 degrees year-round and teeming with aquatic diversity, the 30-foot-deep, crystal-clear waters of Spring Lake are ranked as one of the best places to dive in Texas. Unfortunately, there is no recreational diving or swimming allowed because of the delicate nature of the springs and the species that rely on them. A Diving for Science course provides an opportunity for volunteers to become certified to dive in Spring Lake. These volunteers are responsible for removing invasive species and helping to maintain the lake. The course has been temporarily put on hold for the duration of the Spring Lake habitat restoration project, but should be opened again soon. There’s also a scientific diving program. According to Fritz Hanselmann, chief underwater archaeologist for the Meadows Center, the program will be geared toward “training students and staff from Texas State and other local universities, government agencies and other professions on how to conduct science underwater.” There will be a number of focused underwater courses, such as Underwater Archaeology and Under­water Photography. This program will help foster the technical skills necessary for future leaders to address complex water problems by providing an underwater laboratory for students and researchers. Not a diver? Not a problem. The Meadows Center for Water and the Environment provides other outdoor recreation opportunities. At $9 for adults, and $6 for children age 4-15 (children 3 and under get in free), the glass-bottom boats will always be a favorite at the Meadows Center. If you are a birder or an amateur nature photographer, go for a stroll on the beautiful Wetlands Boardwalk, or hike the nature trails at the City of San Marcos’ 250-acre Spring Lake Preserve. If kayaking is more your speed, take an eco-tour in a glass-bottom kayak around Spring Lake to gain up-close access to the wildly diverse inhabitants (advance reservations required). While you are waiting for your boat or kayak tour, check out the Discovery Hall and Endangered Species Exhibit. Farther downstream, cool off in the river as it runs through Sewell Park. Field trips and tours give children an awe-inspiring glimpse into the artesian springs and provide greater understanding of the interconnections between surface water and groundwater. The Aquatic Sciences Adventure Camp, offered through the Edwards Aquifer Research and Data Center, gives kids an in-depth understanding of complex aquatic systems through hands-on learning opportunities that they will remember for the rest of their lives. Understanding the state’s water resources will be crucial in the years ahead. For many Texans, the recent drought has taken a brutal toll. Policymakers are currently struggling to come up with better solutions, from enacting required conservation initiatives to funding the 2012 State Water Plan. The Meadows Center for Water and the Environment is poised to provide strong science to support a better way forward for water management in Texas while also providing a first-rate environmental learning center where a theme park once stood.